Plastic thermoforming from Gregstrom includes vacuum forming, pressure forming, and twin sheet forming. Plastic thermoforming produces high-quality parts from plastic sheets in a range of sizes and thicknesses. Depending on the part size and the production quantity, thermoforming can cost significantly less than either injection molding or blow molding, two popular plastic manufacturing techniques. Cost is important, of course, but product designers also need to consider flexibility, tooling, quality, and assembly. There are three basic types of plastic thermoforming services. Vacuum forming controls costs while promoting quality. Temperature-controlled aluminum tools are not required, and wooden patterns and epoxy tools also help control costs. Pressure forming produces plastic parts with crisp lines, tight corners, textured surfaces, and other intricate details. Twin sheet forming creates strong but lightweight plastic parts that are hollow in the middle and detailed on both sides. Gregstrom provides all three types of plastic thermoforming services and adds value through design assistance, assembly, and testing. Plastic thermoforming also supports the production of strong plastic parts, which provides designers with alternatives to more expensive materials such as metals. As a heavy-gauge thermoformer, Gregstrom supports sheet sizes up to 60” x 120” (.040” – .500” thick). Heavy gauge thermoforming turns thick plastic sheets into extremely durable parts. Applications include enclosures, housings, and panels for vehicles, instruments, and equipment. For best results, part designers need to account for tool selection, dimensioning, and stretch or draw ratio. Stretch or draw ratio describes the relationship between the surface area of a formed part to the starting area of the original plastic sheet. The larger number represents the beginning surface area of the unformed plastic sheet at the opening of the mold. The smaller number represents the size of the part once the plastic is formed over the mold’s interior surface. Heavy gauge thermoforming can support stretch or draw ratios that are higher than 3:1 (especially with male tooling), but part designers need to understand that thinning will occur. To calculate the stretch ratio, the average length, width, and depth of a part are considered. For a 3:1 draw that starts with a .250” sheet, the estimated average finished wall thickness is .080”. 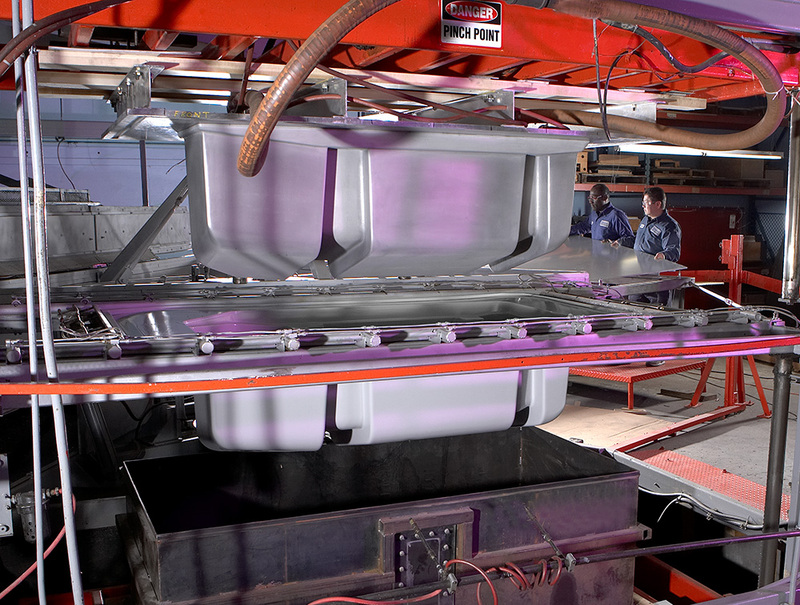 Tool selection, dimensioning, stretch ratio, and draw ratio aren’t the only design considerations for heavy gauge thermoforming. Part designers also need to consider tolerances, radii, ribs, undercuts draft, defects, material selection, and parts finishing. Picking the right manufacturing partner is an important decision, too. There are two types of plastic thermoforming molds: male and female. Male molds are usually less expensive than female molds. Generally, parts formed over a male mold will retain the color and texture of the extruded sheet. Because the plastic sheet shrinks as it cools during the molding process, the thermoformed part adheres to the mold surfaces. To release the part, draft is required. Draft is the angle the mold wall makes with the vertical. Typically, male molds require greater draft angles than female molds. (With female molds, deep parts and molded-in textures also require additional draft.) With male molds, draft is also used so that plastic parts that are designed to fully nest will release from each other without sticking or jamming. Thermoforming tools typically cost less than the tooling that’s used in other plastic fabrication processes. In addition to machined and cast aluminum, thermoforming tools can be made of wood, epoxy, and other low-cost materials. Lower tooling costs are important, but cost isn’t the only advantage. By using textured thermoforming tools and plastic sheets in custom colors, product designers can eliminate the need for painting parts. Non-metal tools that are faster to produce can also result in shorter wait times for tooling. Thermoformed parts don’t exhibit the sink or gate marks, porosity, and other surface imperfections that are common to other plastics manufacturing processes. In addition to a flawless finish, thermoforming supports fine details such as clean lines, tight corners, and textured surfaces. Thermoformed part tolerances are a function of multiple factors, and well-designed parts can meet demanding requirements. Subsequent operations such as plastic routing produce clean edges and burr-free finishes. Thermoforming also supports final product assembly. For example, this digital taxi media display integrates with lights, electronics, and metal hardware. Similarly, this plastic taxi top supports mounting to the vehicle’s metal rooftop with fasteners. Applications for thermoforming also include medical instrument case assemblies with a thermoformed base, a clear plastic cover, and a latch, handle, and hinges. Is plastic thermoforming the right choice for your next project? For nearly 70 years, Gregstrom Corporation has been forming and molding plastics at our Made in the USA manufacturing faciliy in Woburn, Massachusetts. To learn how our plastic thermoforming services can support your application, contact us online or call (781) 935-6600.